I love putting together these Thursday Threads posts. 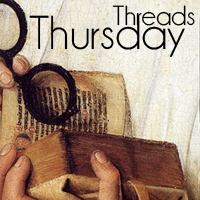 Not only are they a fun way to get to know each other, but compiling the Thursday Threads post means that the work week is halfway over. Hooray for that! This week's question: where and when are you reading? Marg: I am a bit all over the place at the moment! I am listening to A Breath of Snow and Ashes by Diana Gabaldon on audio book (which is a bit odd because I reread Cross Stitch last year but it is the only audiobook that I own so I just decided to start listening to it). I am reading The Girl You Left Behind by Jojo Moyes which is a duel timeline novel with part set in WWI and part in modern day and also The Doomsday Book by Connie Willis which is time travel back to medieval times. Nanette: I'm in 15th century England, reading Philippa Gregory's The Kingmaker's Daughter. (Look for my review next week.) We're in for some cooler weather this weekend--perfect for curling up under a blanket and doing some reading! I was reading Roman Blood by Steven Saylor in the warmth of the Amalfi coast; now I'm finishing it back in England, as you say, under a blanket. I'm in Depression New York with H.A. Hargreaves in "Growing Up Bronx". I'm in England in the 1500s reading Brandy Purdy's The Queen's Pleasure. I'm just finishing up a visit to Constantinople in the 1890s. I'm reading Tears of Pearl by Tasha Alexander. I'm in 13th century Scotland reading Warrior's Redemption by Melissa Mayhue. Soon as I finish, I will be traveling to the 12th century with John FitzGilbert in A Place Beyond Courage by Elizabeth Chadwick. Oh! BTW.... Marg, I love the Outlander series by Diana Gabaldon. Each time a new one comes out, I reread the prior ones. Takes a while and I start about 2 months before the release date of the next one. Each time I turn that last page I hate to leave them. I'm in 1970s Northern Ireland, reading Watching the Door, a non-fiction selection for the European Reading Challenge. I am off next to revolutionary war period America for a review I need to do for the HNS. A bit late for last week's Thursday Thread ... but I've just read two books. One is The Mathematics of Love by Emma Darwin and the other is Fire in the East by Harry Sidebottom. Darwin's novel weaves a story set in early 1800s with one set in a more present-day world - both are about love and loss. Sidebottom's novel is set around 255AD at the eastern edges of Rome's empire where the Persians lay siege to a Roman city. Both books highly recommended.